Today’s rain set off a debris flow in Pfeiffer Creek. 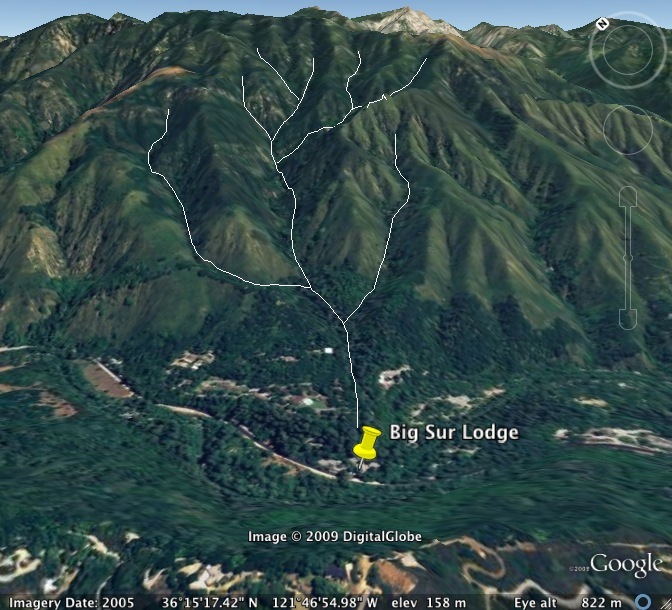 The flow may have put some water into the Big Sur Lodge. The highway is completely blocked and is expected to remain closed until sometime tomorrow. The Big Sur CATS site has posted some pictures. The National Weather Service is blaming the debris flow on a thunderstorm that dropped .84 of an inch of rain on Big Sur in one hour this afternoon. Showers are expected to diminish overnight. CalTrans thinks they may have one lane open by 10:00AM. The highway is now fully reopened. Big Sur Kate has posted more photos. This entry was posted on Tuesday, April 7th, 2009 at 10:04 pm and is filed under Big Sur, Fire, Flood & Apocalypse. You can follow any responses to this entry through the RSS 2.0 feed. You can leave a response, or trackback from your own site.